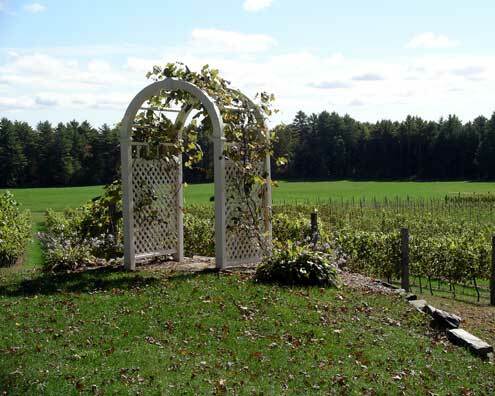 Established in 1990, Flag Hill’s vineyard produces six varieties of grapes on over twenty acres of vineyard along the Lamprey River in Lee, right on the line with Durham. You are welcome to tour the tidy rows of grapevines, which are especially beautiful in late summer when the vines are fat with fruit. Flag Hill maintains a mailing list, so you can be notified of the dates of harvest- and you can even participate by picking the grapes if you would like. Flag Hill also has been producing distilled spirits since 2004, the most famous product being their General John Stark Vodka produced from local apples. This is available at the NH state Liquor Stores, but a trip to the distillery is much more fun, and might include a tour and free sample! Liqueurs are produced here from maple sugar and cranberry, and a wonderful port along with a dozen varieties of wines. The Flag Hill chef also bottles his own line of oils and rubs, sold in the gift shop. We found that these local liqueurs and wines were a big hit when visiting friends in Europe, because our last experience of bringing them a bottle of maple syrup drew a lot of blank looks. Everyone enjoys a sip of an after-dinner drink, but not everyone knows what a pancake is! It’s always nice to give a gift with “New Hampshire” on the label. Winter might seem like a boring time to visit a vineyard, but during this time of the year pruning is taking place, and vines will be available for making home decorations, starting on March 20th. If you are on the mailing list, you will be notified when different clippings are available. Flag Hill is open Wednesday through Sunday 11:00 am to 5:00 pm. To contact the vineyard you can call 603-659-2949. For more information on Flag Hill check out their website.